Six people have been confirmed dead with some 39 others sustaining various degrees of injury after a Metro Mass Transit (MMT) bus traveling from Sunyani to Kumasi, collided head-on with an Opel Taxi cab at Boaso, a farming community near Bechem in the Tano South District of the Brong Ahafo Region. The Opel was being driven by 30-year-old Samuel Kojo Eshun, who was travelling from Bechem to Sunyani at about 7:00pm Wednesday night. Confirming the incident to Citi News, the Tano South District Police Commander, Supt. Abraham Bansah, said the police got information about the crash and quickly moved to the scene with officers of the Ghana National Fire Service (GNFS) for rescue efforts. He explained that the driver of the Metro Mass Transit (MMT) bus, in an attempt to avoid hitting a man who crossed the bus, lost control of the steering wheel, and veered into the lane of the taxi, resulting in a head-on collision, killing the man and all occupants of the taxi instantly. He explained that the impact of the crash compelled the bus to drag the taxi cab into a valley making, the rescue process difficult, which compelled the GNFS to cut through the mangled vehicles to retrieve the trapped bodies. Supt. Bansah said the bodies of the dead have been deposited at the Bechem Government Hospital awaiting autopsy. He appealed to residents to report at the station for identification of the deceased as only one has been identified so far. 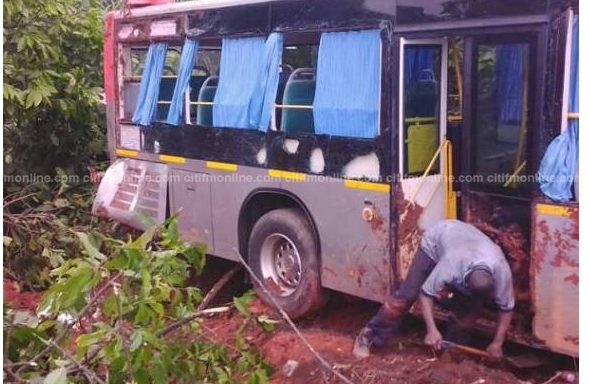 He said injured occupants of the MMT bus are receiving treatment at the Bechem Government Hospital, and the Duayaw-Nkwanta St. John of God Catholic Hospital. He also lamented the wanton disregard for caution and road safety regulations by drivers and other road users, in the face of intensive public education activities by his outfit, and vowed to deal ruthlessly with offenders. 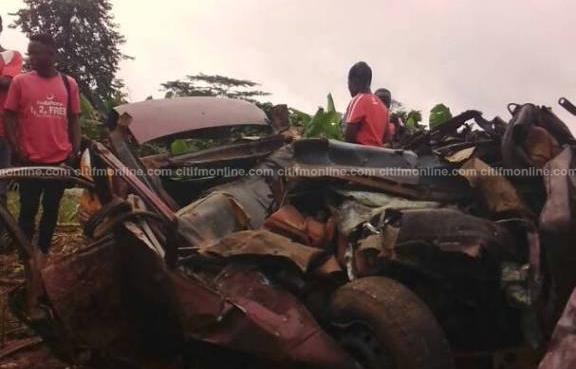 On Tuesday, November 21 this week, six persons also died with eight others left in a critical condition after two vehicles they were travelling in collided at Hwidiem in the Asante Akim North District of the Ashanti Region. According to the police, a Kia truck, which was loaded with yam, lost control and veered off the road running into the Ford transit bus. Hundreds of Ghanaians die each year through road accidents.